Artillería experimental diseñada tomando como base el M3A3. El T57 se desarrolló y probó durante el otoño de 1942, pero nunca se produjo en serie. Possibly the most well-rounded artillery in tier 2. It has decent gun performance, mobility (though traverse is not very good), and top speed. It's the only one to have good armor. For its tier the T57 has some of the best armor around, a high rate of fire and it does good damage, though as with all tier 2 SPGs, the splash damage is negligible. 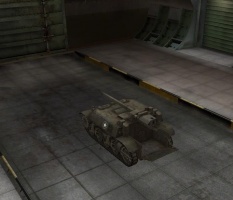 With most self-propelled guns, you have to worry about light tanks getting close, but in the T57 they pose far less of a threat and can be dispatched in "tank destroyer" mode (direct fire) with the T57's cannon. It's a great vehicle to begin learning about how to play artillery. With a wide arc of fire, the T57 is good in large open maps, especially when the enemy has a lot of medium tanks. The T57 has a weakness that's uncommon in other SPG's: its gun has a low vertical arc of fire. As a result urban maps are more challenging than they usually are for artillery. Also if the target is above you, then there isn't much you can do. Despite this, the T57 still allows you to be a major contribution to your team. 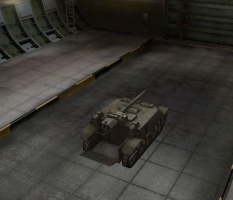 With its significantly thicker armor than other SPGs of similar tier, the T57 can actually benefit from a Spall Liner. This is primarily to protect against ramming by enemy scouts, but it will also offer some protection against splash damage from enemy artillery fire. However, it's not enough to save you from a direct hit. A Gun Laying Drive is very helpful, but not worth it at this low of a tier unless you are keeping it long after researching its successor. 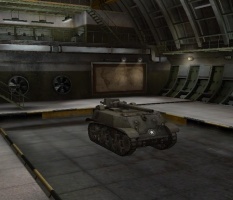 Many players love the T57 so much they decide to keep it in their garage. Nothing carries over from the T1 Cunningham. However, engines and radios carry over from the Stuart line, as well as the first two tank destroyers. 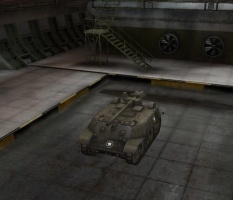 If you have engines or radios unlocked from other American tanks, install them right away. Your first priority for research should be upgrading the suspension. Since you have no turret, you need to be able to turn quickly. The 3in Gun Motor Carriage T57 was based on the Light Tank M3A3 chassis with an M7 gun and a Continental engine. The engine was moved to the middle of the hull and a 3-inch gun was mounted in a superstructure in the rear. The project started in September 1942 and was abandoned in February 1943.
a b c Hunnicutt, R. P. - Stuart: A History of the American Light Tank, p 298-301. Hunnicutt, R. P. - Stuart: A History of the American Light Tank, Presidio Press 1992, ISBN 0-89141-462-2. Esta página fue modificada por última vez el 25 oct 2016, a las 10:29.